Big fan of pancakes here. I have a staple recipe, but every now and again I’m out of one ingredient or another and have to be creative. 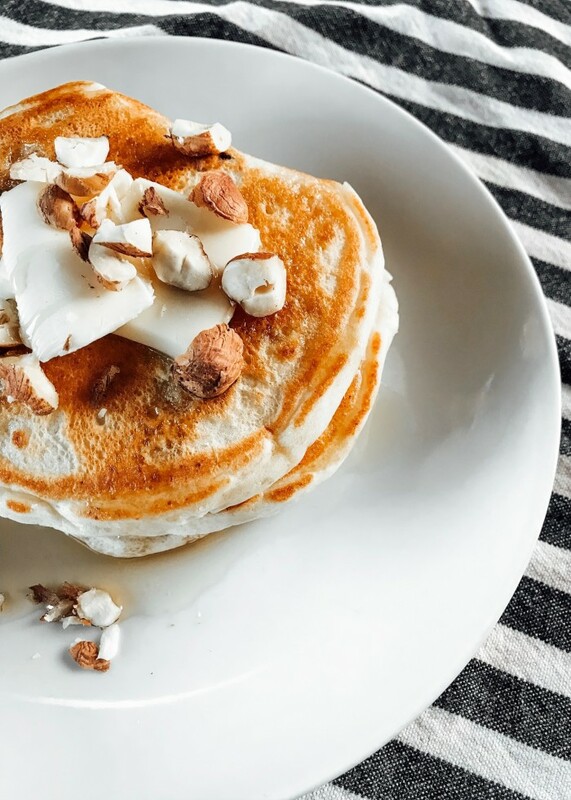 Sometimes, that creativity is magic and today, that magic is called hazelnut ricotta pancakes. Lordy, lordy, these were divine! Are divine. Totally making them again. And, sharing the recipe with you today! The key to pancakes though is heating your griddle thoroughly. Before I even get ingredients out, I turn on the griddle to medium/high (6-8) and butter it well (sometimes I use coconut oil). Before I pour the first pancake, I turn the heat down to low (2-4). I use a 1/4 cup measuring scoop for each pancake, stirring in between each scoop to make sure a fair amount of hazelnuts and chocolate chips make it into each scoop. When bubbles form and the sides look matte, it's time to flip - usually 60-90 seconds on the first side and then just 30 seconds once you flip to the second. Serve hot, obviously :) and top with butter, maple syrup, and a sprinkle of hazelnuts.